We are located in Austin Texas and have been selling quality used brass for 19 years. 2-28-19 Just to update you that I’ve received the horn in great condition. Thanks again! 1-30-19 Hello, I love the horn.It's a great player/collector. I didn't see the shop card enclosed,so please check that for me. I'm looking for a pre war Martin Committee Handcraft #3 Bb trumpet. Let me know if you have anything like that. 1-26-19 Trumpet arrived today - it's fantastic! I love it. Better than I expected! Thanks for packing it up so well aswell! It's in great condition and I'm so pleased with it! 12-27-18 Thanks again for checking. All is well with the trumpet. 11-6-18 Thank you for the wonderful horn! 10-10-18 Exactly as shown and bettet than described, super nice condition, shipping was fast and easy, seller was really great to work with. Thanks! 10-3-18 Easy transaction. Received on time. Horn condition as described. Nice! Thank you. 9-21-18 It is a great horn, and I am satisfied with it. Thanks for your patience with the process. Thanks again for your help, and the fine horn. I expect we will make some fine music together. 9-3-18 Thank you so much! We are super excited about our professional trumpet for Katie. You have really given us excellent service and we are very happy customers. Will certainly recommend. 8-6-18 Great Trumpet - plays great, look great. 6-1-18 I love the horn. 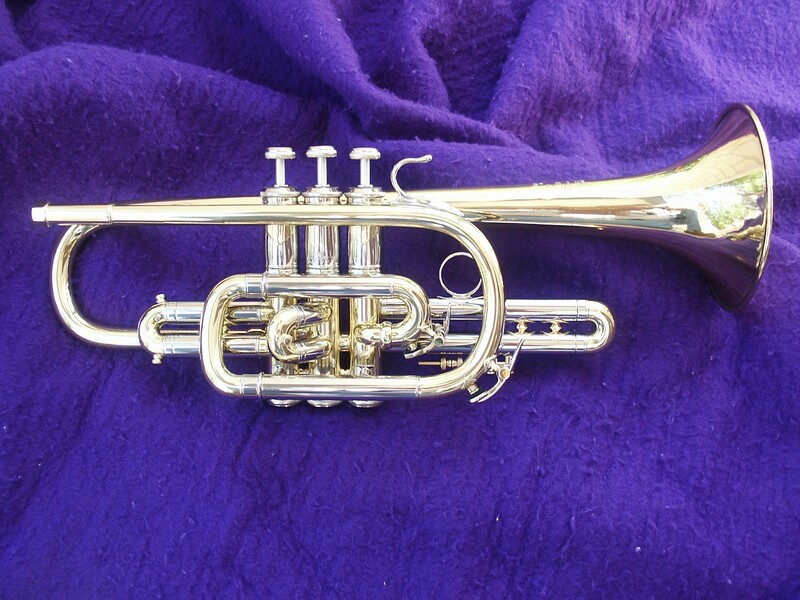 It is my second Kanstul, but sixth horn that was made by Zig Kanstul via Olds and Benge. Horn came as promised in super condition. I played it for Spam-a-lot. Thanks. 1-12-18 Got the horn today! It’s in fantastic shape - thanks again! 11-14-17 I just wanted to follow-up with you. Katie had her lesson with Dr. K today. He loved the trumpet as does Katie, so perfect result, its a keeper :) Again it was a pleasure to meet, and do business with you; thank you so much for finding this trumpet for us. 11-9-17 So far the trumpet has been great. Jake really likes it. His private lesson teacher saw it and gave it a thumbs up. We will be keeping it. 8-25-17 Nathan has been playing everyday. He loves his trumpet! Thank you so much! 7-23-17 I just wanted you to know how pleased I am with the trumpet I got from you. 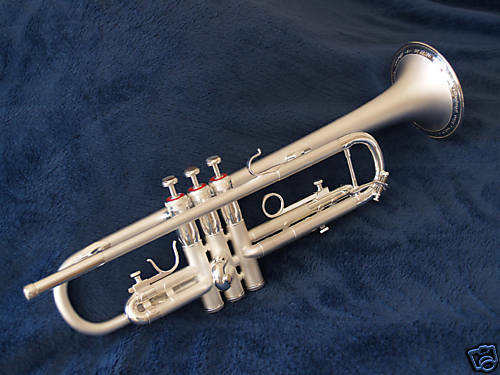 I was looking for a great backup that was different from the main trumpet and this is it. Thank you very much. 7-14-17 This is an awesome horn! After just two days of playing it, I realize what the hype is about. The SR is a GREAT horn. The SR seems to have a bit more resistance than my other horns but when I "push it", it delivers! Many thanks to you for making the purchase and delivery so easy! 6-28-17 We are keeping the trumpet. It seems to be just what we have been looking for and we are very happy with the instrument! I like dealing with people who have integrity and I would not hesitate to recommend you in the future. 4-18-17 I will keep the instrument. It's a nice horn. 2-3-17 The horn is great. Thanks again for getting it to me so quickly. 11-23-16 Just want to let you know that the leadpipes for the Selmer picc arrived yesterday without any issues after they were stuck in Customs in Madrid for a week. They look a lot more substantial the the stock pipe, but fit very tightly and I think the sound is a little fuller and sweeter then stock. 8-23-16 Everything is great with the new trumpet. She loves it. Thanks for your help! 8-10-16 Wonderful horn hits hi C and G above clear and in tune ...cannot put it down! Would love to also get a great Chicago Benge ML or larger. Please keep you eye out for me. 8-8-16 I meant to email you yesterday after I finished practicing. I love the trumpet! It will be so much better when I get my "chops" back and I am not splitting notes but I will get there. Right now, I can only play for 30 minutes or so before my lips get swollen and I have to stop. Thanks for all the extra stuff too like the cases, the additional mouthpieces and mouthpiece cases, cleaning equipment, etc. I love having the old Olds mouthpiece and have also used the 7c. 7-19-16 The P5-4 is in great shape and plays really nice. Thanks again. 6-15-16 Nice meeting you and doing business with you. Thanks for the info and referrals. Kaitlyn is really enjoying her new trumpet. 5-24-16 I just wanted to let you know that I've received the horn and absolutely love it, it's just what I was looking for! Thank you so much for working with me, it's has truly been a pleasure! 5-14-16 Thanks so much again for everything today. Kelly is beyond thrilled and practiced for about 6 hours today ! She's loving the sound and how much easier it is to play than her student trumpet. 5-12-16 THANKS! She loves the horn. 5-3-16 The instrument is as described and was delivered without delay. Good sale. 5-2-16 I’ve been meaning to email you to say that the Bach arrived safely (albeit with a couple of day’s sleep over at the Australian Customs facility!). The “Lone Star” is a great horn and plays well. It should feel at home in Western Australia because just like Texas is a big state in the US, likewise Western Australia is in Australia! 3-24-16 I got the horn today. I love this thing. I would not let it go for 3gs. Thank you very much. In your debt. 2-11-16 My son loves his trumpet. A couple of guys in the trumpet section tried it and then asked for your website. Mark it as sold! 1-7-16 I think your description of this horn was very good unbelievably well enact horn considering it's age. It rivals my Bach 37 but I still love my xeno though. I know this wasn't cheap but in the shape it is and the playability is better than I anticipated. I'm keeping your card and may, if money permits, buy more from you in the future. . I'm a comeback player after 24 years away from the trumpet and starting over from the beginning. The tri tone finish is very nice. Im tickled pink with this horn. I didn't want to buy a trumpet that had been stripped and re lacquered because it takes the soul away from these old horns in my opinion. Perfect! 11-24-15 I received the CG Benge. It's a great one. Thank you! 11-18-15 I wanted to let you know that the trumpet is great. The trumpet is a definite keeper sounds great and I wanted to let you know so you could mark it officially sold on your website...Thanks so much and have a nice holiday season. 9-23-15 Consider it sold. This is a very nice horn. Thank you for your quick shipment as well. 8-20-15 The trumpet arrived last Thursday and my son is so excited to play on this beautiful horn. His private teacher who also repairs and services horns was very pleased. I expect it will serve him well for many years to come. Definitely satisfied. I’m so very happy I found out about you on Trumpet Herald. 8-6-15 Thank you very much! You always have the best stuff! I am sure when I save up some pennies, I will be back for another purchase someday. 6-30-15 My son was just so happy and explaining all the positive attributes and showing me what is so amazing about the trumpet and he loves the way it plays etc. We have been saving for a while and the majority of the savings were his and he is only 15 and still In school but he has a Saturday job and has worked since he was 13 in a cycle shop. But music is his passion and I have never seen him so happy. Many many thanks to yourself. As a career he is hoping to go into the Royal Marines Band Service as a bugler and drummer and is working towards that at present and they take them from 16 upwards. My thanks again to you and I am sure he will keep looking in your website for the future. 6-11-15 Thanks again,. The horn got here in great shape. It's a beauty and a good player. Though there are a few "pending" days left, you may safely consider it sold. Always good doing business with you. 6-1-15 We have decided to keep the trumpet Thank you. 5-8-15 So, the trumpet was approved and we will be keeping it. 3-31-15 You can mark it as sold on your website. This is one of the best playing Couesnon's I've ever played. Thanks again! 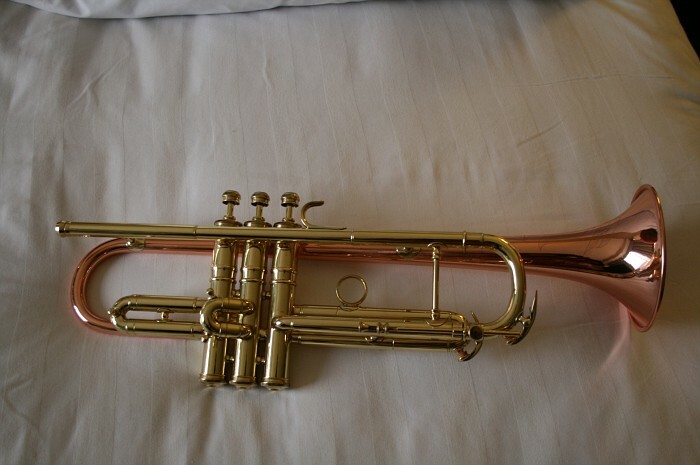 3-6-15 I received the Schilke Cornet today, all completely safe and sound. Looks great, and plays even better. Many thanks - I'm looking forward to using this at our upcoming national band championships over Easter. 2-24-15 First of all thank you very much for your patience and flexibility. Second of all, we are keeping the trumpet! It's a great fit. 2-21-15 Got it-gave it to him last night-he was totally surprised and he loves it. thank you so much! 1-29-15 The trumpet is great. The sound is beautiful the valve action super fast etc... I have other Olds including a Recording, but this is really special. It sounds great and is easy to play in all ranges. 1-29-15 It was nice to do business with you. In addition to playing the trumpet since childhood, I am an impassioned collector of trumpets. If you come into possession of other collectible and valuable Bachs, do not hesitate to reach out to me directly. 1-29-15 Apologies in the delay in contacting you. Just a quick message to say that the 37 sterling silver trumpet that I bought from you a few weeks back arrived without a problem (apart from the very inefficient British postal system :-)). I'm getting on really well with it and it's definitely a "keeper". Sounds rock solid in the orchestra! It's been a pleasure dealing with you. Many thanks. 12-17-14 Thank you! Gracie is so excited to have a trumpet and so far she just loves it. She came home last night and played for what seemed like an hour trying out all the music she had with it. 11-12-14 I am very happy with the the horn — it looks great and sounds beautiful! Thanks for the excellent customer service and I hope I am able to do business with you again. 8-19-14 The sound of the trumpet (Super Recording sn 19062) was great and the valves worked well for my son's teacher when he played it today. My son really likes the trumpet and I love the sound! 7-16-14 Horn arrived in grand condition; appreciate the case. Plays well; its amazing how similar it plays to my Martin Committee, fluidly similar but with a little more edge. How did you determine the born on date; I ask because I've seen some Benges on sale that are in a slightly higher Ser # (68-69xx)range that were made in 1968s; don't really care as its a great playing horn, just curious. 5-15-14 I think the 5c that was in the case will be fine. He played that in his lesson yesterday and seemed comfortable, so let's go with that. Thanks! 4-18-14 I got the Olds Recording yesterday and didn't put it down for over three hours. I don't think I have ever played a trumpet I enjoyed playing so much...and I'm a bit of a hard sell on trumpets- I think I told you I've been primarily a cornetist for some time. I've been playing new Monette and Marcinkkiewicz trumpets, testing a lot of vintage horns (even a Conn 28A in the hopes of finding a compromise). The only other trumpet I've been this excited about was a Monette MF prana I played a few weeks ago. But I think I might like this horn better. I am just blown away by the intonation, flexibility, ease of the upper register and tone. Then there's all these little surprises- the sound of the half valved notes is amazing, it's super easy to manipulate the timbre of notes anywhere on the horn, and the valves are a joy to work with. If the super recordings are better than this, they must be truly magical. Thank you for holding it for me, packing it so well, shipping it so quickly, and communicating well the whole time. I couldn't be happier! 4-8-14 Have had the '68 Bach for about a week now and love it. Absolutely more centered and resonant than my 37 from the early 2000s. Thanks a lot! 3-19-14 We missed the delivery of it at our home by five minutes but were able to get it last night at the post office.We presented it to our daughter last night. She was so delighted, she just squealed and screamed - and then played it all night. The horn and the case were in great condition. It has truly been a pleasure doing business with you. Thank you again for everything! 2-19-14 Just quick note that the horn arrived safe and sound. Got to play it this evening. Thanks, enjoying the horn!! 1-31-14 The Benge Burbank landed safely today. It was just as described. Sound is wide open, finish is beautiful, valves like butter and the compression is good too. Thanks for packing nicely and for delivering a piece of history into my hands. I’d love to keep it. 1-14-14 So, the horn is fantastic. Had a bit of trouble finding a mouthpiece to fit it right - I thought it would take a french taper mouth piece - but the two I had did not work. Found a Warburton which fit great and the horn plays great. 1-2-14 I just want to let you know that I'm delighted with my Chicago Benge. It's definitely a keeper. Thanks again, and best wishes! 12-30-13 everything is great. thanks again and happy new year! 12-19-13 Thank you. I will take a look at those links. David is enjoying his new trumpet. Thank you so much! 10-11-13 The Olds Super Recording is great! Thanks for a wonderful trumpet. I am totally satisfied! 8-12-13 Just wanted to let you know that I had my shop guy here in NYC look at the Mt. Vernon toady and he gave it is stamp of approval. I really love it. Sounds great, looks great. Thanks a lot. 7-21-13 The 66 bach strad looks beautiful and plays even better. Its been a pleasure being able to be informed about everything. Thanks so much. 7-8-13 Received the 1946 Olds Super trumpet. Great condition. Beautiful instrument. Consider it sold. Thank you for sending the trumpet promptly. Thanks also for giving me the very nice gig bag, and for including some extra 3rd slide bands as requested. 7-8-13 We had the horn checked out and will be keeping it. 4-15-13 I am very pleased with the trumpet and as you can see I have removed the old laquer and given it a really good clean. The quality of the Olds make is evident both materially and in the sound and ease of which the trumpet blows. The valves are in superb condition and all in all I rate the instrument equal to, if not better than my Bach Strad. I am obviously going to find out what she can really do over the next few weeks. Thank you again, I am very happy with my new trumpet. 4-12-13 Just a note to let you know I received the large bore Bach trumpet yesterday. It plays great and is exactly what I've been looking for. Thank you for the very pleasant buying experience. 3-13-13 i did get today the olds cornet in good shape So very very much thank you !!! 3-4-13 trumpet arrived on friday, picked it up yesterday as I have been away for the weekend, extremely pleased with it, plays well, very even scale throughout the range. I love the French instruments, I have several Selmers. I have been trying to research the Buffet, not much info available as to actual maker. Thank you again for your attention. 2-25-13 Thanks so much for the trumpet. It arrived safely. It is indeed in lovely condition...Thanks again. I love it !!! 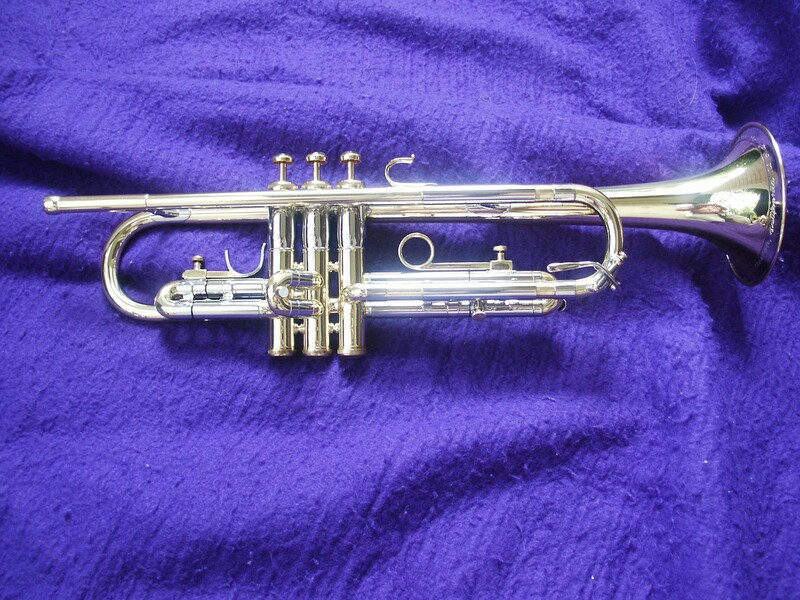 2-23-13 I received the trumpet yesterday in perfect working order, it is beautiful. Thank you so much for thinking of me when you got this one in. It will, I'm sure, bring years of happy playing. 2-17-13 It arrived on Friday and I'm really liking this horn. Thanks. I'm definitely keeping it. 2-4-13 I love my new horn -- thanks!! 1-31-13 I am pleased to say that Centex Brass is a great place to buy a horn. Neither my wife nor I had much experience in musical instruments, so it was a bit scary trying to by a horn for our son. The first experience with buying him a horn in middle school was not fun and we never really felt comfortable with the process. As a result, we were filled with trepidation when looking for a second horn for him to use in high school. Your expertise in the field and your willingness to help us feel comfortable with the purchase was fantastic. More importantly, the service and support after the sale was outstanding. We will be recommending you to other parents in our band as well as other friends with band kids. 1-29-13 This horn is "as advertised" and passed the test of two concerts just three days after receiving it. I'll be sure to tell my trumpet buddies to check out your inventory. 1-22-13 got the horn… I can't believe how quickly it made it through customs. It looks and plays great. Thanks so much for your help. 1-1-13 I did receive the trumpet with no issues. I am very pleased with the trumpet and my son loves it! It is in great shape and plays well. 12-27-12 After the seven day trial, I am keeping this horn. Thank you for your service and I will recommend you to others in the future! 11-11-12 Yes trumpet arrived a few days ago - I've been out of town but someone was there to collect it - thanks, it is a beautiful horn and I'm enjoying getting to know it. 11-2-12 Yes, we are keeping the trumpet. My son is very happy with it - it is just what he was hoping for. Thank you again for making the process very easy for us! 10-31-12 Thank you. I will keep the trumpet. I been enjoying it. It plays well and works well . Thank you. Working with Centex Brass has been a real pleasure. Purchasing a used horn via the Internet was a pretty scary thing for me, but your satisfaction guarantee and how you made it work for us was remarkable. I will recommend your website to anyone I hear that is looking for a good used horn. Best wishes to you and continued success. Nice horn, I’m keeping it. Thank you for your accurate description and fast response in shipping. I really appreciate your overall customer service, including your knowledge, patience, and efficiency. I will recommend you to others in our area and will be contacting you in a couple of years when I am in the market for another professional Bach Strad. I received the Bach 43 yesterday. It's a keeper. It was a pleasure doing business with you. I have a million students and somebody is always looking for horns. I'll give them your contact info when they're looking. Thanks. Many thanks for the trumpet which has been received in good condition today. I am totally satisfied with my purchase. It it exactly as described on your website and it was a pleasure to remove the horn from the packaging and to give a blow. I was introduced to Olds' instruments many years ago when I was given a loan of an Olds trumpet for a gig. It is a pleasure to renew my acquaintance with the brand and to hear the tone for which Olds instruments are renown. Again, many thanks for your excellent service. Thanks for another nice horn, and I'll stay in touch. The horn is great. It is beautiful and has just the sound I was hoping for. Such a classic horn...I'll probably own it forever! Thanks for your terrific service! Picked up Benge from Post Office yesterday, extremely pleased with it. Gave it a good workout tonight and amazed how uniform the sound is throughout the range. Thank you for your attention and you can now cross it off the list. Just wanted to let you know I will be keeping the trumpet. Thank you so much for your excellent customer service, I will definitely be recommending you to anyone looking to buy a new instrument. I received the horn 4 hours ago. I couldn't help but write a little bit about why I ended up at your website. I hope you find it useful. 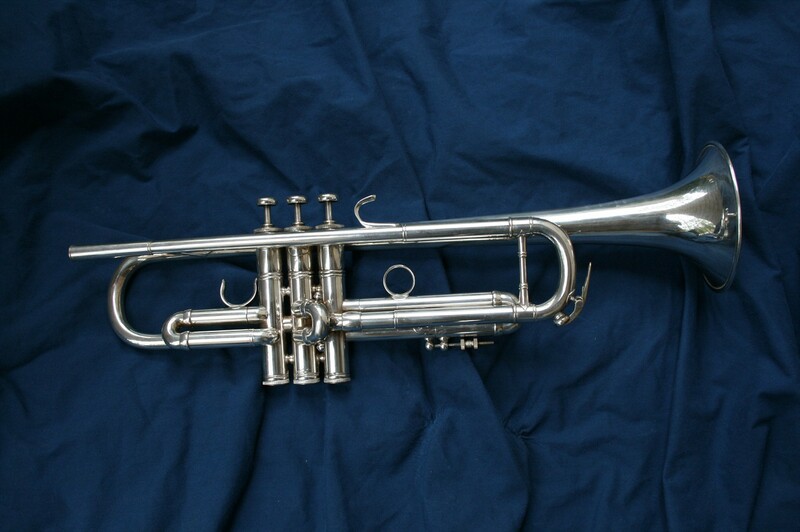 In 1950, I started playing a student variety Reynolds cornet. 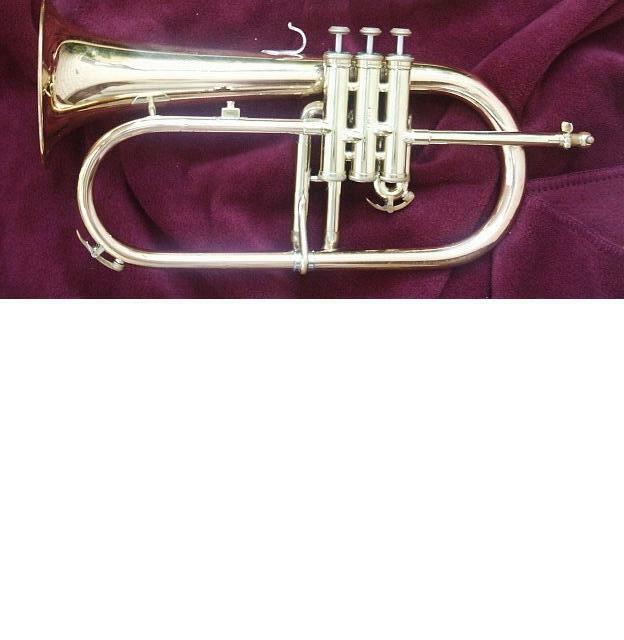 My family didn't have a lot of money at the time and I was pleased to have this used horn with a 5A mouthpiece. I didn't know the horn was not the best. I was told more than once by my band instructor that I'd never be able to play high notes with the 5A mouthpiece, but it was the only one I was likely to get, so I learned to play the high notes anyway. I just played the cheap horn the very best I could. By the late 1950's, I had been my San Antonio high school's first chair cornet player for four years and first chair in the all-city band for 4 years. I made the first chair position in the all-state band 3 years in a row. I did this, I think, because I didn't know I had a cheap horn. I really had no idea there were really good horns out there. Harry James was my hero and I just assumed he played something like the horn I had. I'm told I have a talent for music, but I also had a talent for physics. I stopped playing while I finished a 30 year career in the U.S. Army Nuclear Weapons Program. I am now 70 years old and have resumed playing in various bands and orchestra's. A friend who is a local band director saw that I was playing a student level King 600 trumpet and told me there were really some good horns out there and that I should try to find something better. I visited music shops in three states until I had tried pretty much everything there is to try...Martin Committee, Xeno, Bobby Shew, you name it. Most of them were truly WONDERFUL to me. The last horn I tried was a Bach Stradivarius 180S43. I think I actually shed some tears of joy. I couldn't believe how easy it was to play. I could play it 'bright, brassy and sassy' when I played jazz and I could play it with great control and tone when I played classical or church music. Ballads were just beautiful... I knew I had to have one. I read about the Bach strike and its potential effect on instrument quality, and with that in mind, the search was on. I called music shops and I wore out my PC keyboard searching for just the right horn at the right price. I struck 'trumpet gold' when I found CENTEXBRASS.COM. The website was simple and had everything I needed. Great photos and details of available instruments. I started scanning the list and there it was...a beautiful 1978 Bach Stradivarius 180S43! Even better, there were several good choices at good, reasonable prices! I sent an email and timidly asked if Centex would consider reserving the beautiful 1978 vintage 180S43 for me. I received a quick reply to my email and agreed to mark it "Sale Pending" on the website. I received the horn in good condition 4 business days after I sent payment. With great anticipation, I carefully unpacked and inspected the horn and slipped my favorite mouthpiece into the pipe and played Jean J. Mouret's "Rondeau", but found myself easing into Beethoven's "Ode to Joy". The horn was wonderful! I played "Misty", because my eyes were. This instrument is my release and to say I am happy with it is the understatement of the year. Yes, I checked other sites, eBay too. The best deal out there in my opinion is CENTEXBRASS. Besides, it's in TEXAS where honesty is a way of life. Thanks You really made my decade! Just to let you know that the Schilke arrived safely this week, many thanks for the excellent packaging! Lovely horn, plays well too so very happy with my purchase. Thanks for a great service, will keep your website on my bookmarks. I just received the trumpet in the mail today. Everything looks good. Thanks again! We received the trumpet a little bit ago. It's BEAUTIFUL! You must have spent a lot of time cleaning and polishing it! It's so pretty. My son played it a little before dinner, and it sounded really nice. He's going to take it to his private teacher tomorrow for his lesson, so he can take a look at it. I'm sure he'll love it, too. We will contact you tomorrow (after school lets out) to confirm. Thank you sooooooooooooo much for your promptiness in getting it shipped out (WOW!) and for your so carefully packing it. And, what a nice, nice surprise it was to receive all the free extras.....soooooooooo thoughtful! And, the case is in really great shape, too. It looks like you replaced the handle....thank you for making sure it'll be sturdy for carrying around. Once again, thank you for all you have done to create a great purchasing experience. We look forward to spreading the word to everyone we know about your company and the positive and unique, personable experience we've had. The horn arrived today and I played it for about 2 hours after teaching a trumpet lesson. It plays like a dream! The condition of the horn is as you said. I am very pleased with the tone and the ease with which I got to G just above the staff. High C sounded good, only I can't play that high all night long like Louis Armstrong. I am very pleased with the horn; please consider it a final sale. The horn came today. Sounds very good with a Bach 7C FL mouth piece in it. I may go to a deep cup later on. For me - It is a keeper. It looks better than the pictures. In the sun light the rose bell looks great. The horn look very much like a Kanstul 1525. I am very pleased. Thank you very much you have my recommendation as a great seller! I got the CG-gold today. I played this horn at the big band rehearsal tonight, and it worked very well. I purchased this horn for my student but I'm thinking of using it.... It's really nice horn!! It's great. Very happy with the purchase. While I especially appreciate your policy of allowing a full 7 day examination period before purchase of a horn, I am letting you know well before that time that I intend on keeping the Recording. Consider it sold. I also want to take a minute to acknowledge and thank you for the way you conduct business.Your honest description, photos, and comments about the Recording were spot on accurate and the packing techniques you use insured its safe and timely arrival. Thanks again for a pleasant transaction. Got the horn and it's beauty. Thanks for everything! This is the nicest sounding horn I have played in quite a long time. Thanks for everything! the trumpet arrived and is great! Again, Thanks for the prompt delivery. Just wanted to let you know we received the trumpet this past Wednesday and my daughter loves it! The case and horn both look great. Again, thank you for your time and I’m sure we’ll be looking your way again if we ever need another horn. I did receive it at work yesterday afternoon and spent an hour on it last night. A really nice trumpet, smooth valves. Reminds me a lot of the 1971 that I had. I've spent a lot of time fighting with old Conns, Martins, and Kings, etc., and appreciate how much easier it is on a Strad. Thanks for the tracking update on the other Strad--I'll be watching for it! My daughter's teacher liked the trumpet and said that it was in great condition and played with a nice even sound. Thank you so much for giving me time to take it to him. I am looking forward to her reaction on Christmas morning. Yes, the are perfect no issues at all. She has decided on the A so we are shipping back the H Mon. We are packing it up now. She loves it, I am glad you had it! The Selmer piccolo trumpet arrived yesterday. Once again, I would like to thank you for the super quick service - I think this package set a record for the minimum length of time to receive a package from the U.S. using U.S.P.S..
Got the Bach 25 Monday. It arrived in great condition. We got it last night right after my son got in. He has been playing it like crazy! Thank you so much for all your help. I was really nervous about buying online but you made this a good experience. My orchestra played Daphnis last week, I used the Bach and got a good result. So I definitely want to keep the horn. Thanks for a great trumpet. I just heard back from my son's trumpet instructor, and he liked both of the Yamaha Xeno trumpets! As a matter of fact, he liked them so much that he is thinking about buying whichever trumpet my son doesn't take. Wanted to let you know that my trumpet player looovvessss the Eb! Thanks for all your help! At first, I was uncertain about purchasing an instrument online, from a store hundreds of miles away. However, as soon as I opened the package I received, I knew it was no mistake. The 1988 Benge piccolo trumpet I purchased was packed away safely in its package, so its seller obviously cared about it up to the point of delivery. The real treat was when I opened the case. 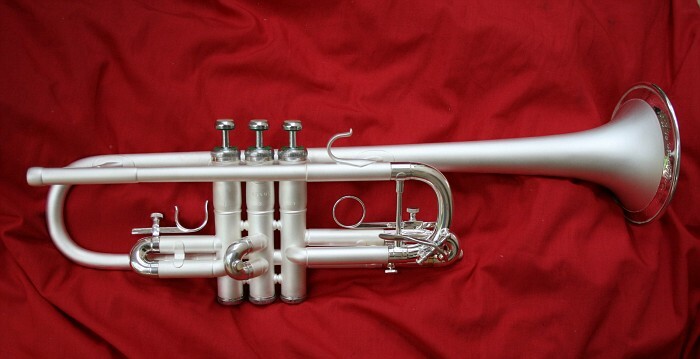 Everything was exactly as it was in the pictures: a USED trumpet from 1988, looking brand new! I tried to find a flaw somewhere, but I couldn't! It also plays (well) as described. It's difficult to find a totally honest business anymore, but Centex Brass appears to be one of them. Pre-sale conversation was also straightforward, yet friendly. Thank you again, and I'll definitely consider you for future purchases. Got the horn!! Nice case too Thanks again!!! I received the horn today, it looks brand new and it plays incredibly well! Thank you once again for your continued patience through this! Arrived safely and enjoying playing it. Got the CG benge today. You sell some very nice horns and I will definitely buy my next horn from you. Trumpet arrived safely and our son and his teacher love the instrument. It’s bright, very responsive and in very good condition. Thankyou for all your help and assistance in finding the right instrument for our son. Hello, the Olds Cornet arrived this afternoon just ahead of another storm. It plays sweet and the valves are fantastic, it will make a nice companion to my Recording Trumpet. Thanks for staying in touch during the shipping, not much we can do about the weather. This is the second transaction we've done and, as before, it's been smooth and effortless. I got the Trumpet 2 days ago and i really like it! Yeah, the horn plays great, way better than other C7s I've played in the past, much more like the 51 Committee I've played. Thanks a lot! As a full-time NYC/NJ area pro, I've bought three trumpets from Centex Brass over the years. Each one has been exactly as described. Plus the transactions have been smooth with great communication. In my experience, this seller has an almost uncanny ability to discern just what is a good trumpet. Buy with confidence here. The trumpet arrived this afternoon. It looks really nice, and I made our boy play us something on it. It sounds really nice too. Thank you for including the mouthpiece and the other extras. Thank you too for your professionalism; always getting back with me right away and answering my questions. That is very important to helping your customers feel like you care, and feel secure about making an expensive long distance purchase. It just arrived, and is just as beautiful as expected. First brief playing test went very well. Thanks. I’ve been meaning to send you a note to let you know that we’ll be keeping the trumpet. Not only does my son love it, the professional we know has played it and said very good things about it. I received the trumpets last week, all ok. Thanks for the good service. Arrived as scheduled. Beautiful instrument. Thanks for having such great service and sending the cases and horns home to try out. My lesson teacher said both horns were excellent. I'll make sure to refer you to any of my friends looking for a horn. The new trumpet is great! Both the band director and private lesson teacher thought it was perfect for Ben and both asked where he got it. I will definitely give them your info to refer others who may be in the market for a trumpet. Ben is thrilled with the new instrument and he sounds great. He loves playing it and takes it to school for his lesson. Thanks so much for a really great horn! It is exactly as described, and truly a joy to play! I got the horn yesterday, and even though I have seven days to make up my mind, I don't want to keep you in suspense. I like it and I'm definitely going to keep it. No return. 8-22-10 Yes, we received the trumpet. Everything looks A OK. Our daughter immediately tried it out and was impressed. The case is in great shape. The trumpet looks as good as the pictures had indicated. In fact our daughter has had a big grin on her face ever since it arrived. Thank very much for working with us and carrying great merchandise. Your customer support has been great. We will definitely recommend Centex Brass to others that are in need of quality hard to find items. Hello, I am the teacher of a student, who just purchased the gold plated Bach Stradivarius 180G37 from your store. I am writing to inform you of my satisfaction in the quality and the reliability of your horns and your services as well as your remarkable pricing, which in these days are very much appreciated. I have never seen such good quality of horns as well as pricing in a store until I saw your store. You can count that as long as I continue to teach, I will continue to recommend my students to your store. I only wish that you continue to perform with the same quality as I have witnessed for my student and perhaps, one day, even for myself as I continue to search for my own professional horns. Again, thank your very much. The Bach 37* arrived yesterday and I practiced on it today and everything is fine. It was a pleasure doing business with you. I wanted to let you know that my son really likes the trumpet and has enjoyed playing it. He showed it to his trumpet teacher and he thought it was a very nice instrument and in great condition. So, all in all we're very happy with it and glad to have done business with you. Just wanted to acknowledge receipt of your trumpet this afternoon. One hundred percent just as you described - no dents, no dings, no scratches and with a case to match. You probably have heard of the annual egg drop from the Massachusetts Institute of Technology Tower. I think they should raise the bar to the level of a trumpet and your packing job would certainly stand the test. Even the gorilla on the luggage commercials, who most likely is an ex-UPS employee in costume and obviously hired for his qualifications, would have had a hard time trying to destroy the contents of your package. So just to reiterate that I am certainly quite pleased. This is a very nice horn. Thank you for your generous 7 day return policy, but, I can tell you right now, I will be keeping it. Thanks Again! the case arrived today, thank you, its fantastic! It's a great playing Strad and probably the last horn I'll ever need. Thanks for your help finding me a great horn! I've owned Calicchios , Benges , and Shilkes and they all are agile , responsive , and had an open upper register , but just didn't have that core sound . This Bach has all of those qualities and that "to die for" core Bach sound . Today I received the trumpet. The trumpet is as described - absolutely OK! - Thank you. I received the trumpet yesterday. It looks and plays great!. I am extremely please with the horn. Also, you were extremely and reasonable to deal with, which made this much easier. I will definitely be recommending Centex Brass to anyone who is in the market for a quality horn. Thank you so much and it was a pleasure doing business with you. The Bach is a huge step up from his borrowed Jupiter…the tone improvement is evident even to my untrained ears and the valves work so much more smoothly. Everything is fabulous! Thanks for following up. Yes, the horn arrived in excellent condition and thanks so much for the gig bag you sent it in. Played it at a couple of gigs and found it to be a really good playing horn (I had one like this years ago.) Quite a difference between the Selmer and the Bach 37 I have been using............I like the Selmer better. Thanks and I hope to do business with you again. The trumpet arrived today and my son has not stopped playing it all afternoon. Thanks for a beautiful instrument. In addition, we've played Olds since 1976 and love the quality and craftsmanship of these wonderful horns. 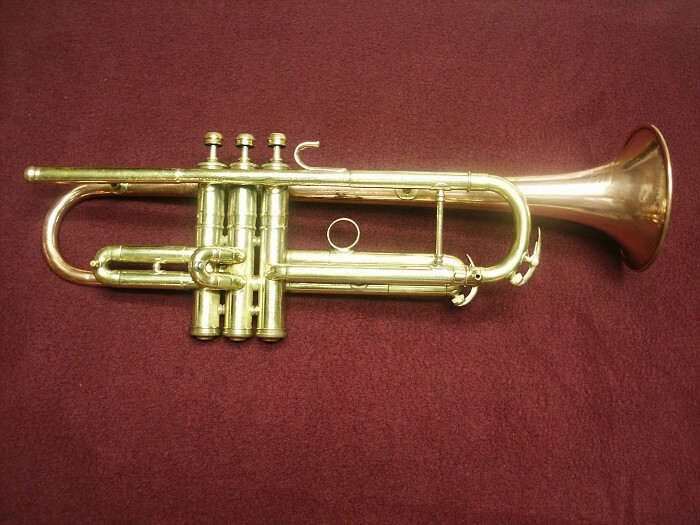 We currently have Bach, Benge, Olds, and Conn trumpets and cornets in our collection. 1946 Olds Super - high school and college horn.